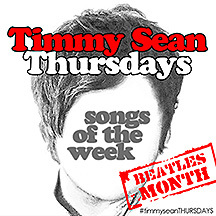 Timmy Sean has pulled out all of the stops for the final entry in the Beatles Month portion of his ongoing, yearlong Songs of the Week project. For his fourth take on a standout track from the richest catalog in modern music history, Timmy, playing all the instruments and singing all the vocals, has put his stamp on the medley from Abbey Road that starts with the gorgeous lullaby, “Golden Slumbers,” and concludes with the exciting finish, “The End.” Putting his heart and soul into this track, Timmy has even recreated Ringo Starr’s famous, and one and only, drum solo on record as a Beatle. And it’s all quite fab, of course! Recorded over the past year and finished up yesterday, this is an exciting close to the Songs of the Week’s Beatles Month. Timmy’s exciting version of “Golden Slumbers – Carry that Weight – The End” is now playing in rotation on Pure Pop Radio, along with every one of the Songs of the Week released since the project began. 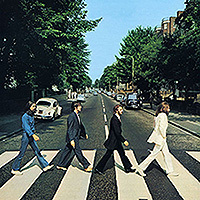 Add the “Golden Slumbers – Carry that Weight – The End” medley to your collection by clicking here. To get all of Timmy’s music, click here. This entry was posted in Timmy Sean's Songs of the Week and tagged alan haber, beatles month, pure pop radio, songs of the week, streamlicensing, timmy sean. Bookmark the permalink. Let’s Spin Some New Tunes, Shall We? We Shall! The Latest Releases are Now Playing on Pure Pop Radio!